37° 47' 12.4" N. x 122° 23'53.7" W.
Ten blocks of art and celebration, and ten stages of music. Plus performances and colorful costumes, vendors from around the world, food and drinks, and much more! The How Weird Street Faire is an experiment in creating peace, bringing together a wide range of eclectic styles and communities. Come join the fun! All ages welcome. Only $10 donation, or $5 in costume! When you enter the faire, you will have an opportunity to purchase a MAGIC STICKER!. 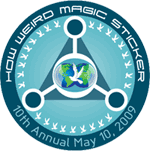 The sticker gets discounts and specials throughout the faire: including $1 off each drink, discounts at vendors and local merchants, $2 off each after party, and most importantly you help keep the faire going. It's our way of thanking you for supporting us. When the day ends, the celebration continues indoors with a variety of music styles represented during the day. So plan accordingly, and bring something warm to wear. The tall buildings in our new location take away sunlight later in the day.